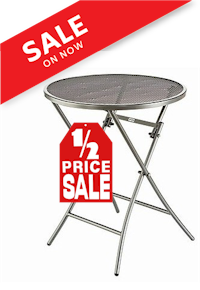 Streckmetal - gracefully formed iron tables with weatherproof expanded metal plates. Sublimely solid with classical form, yet light on the eyes and practiclly modular. A key advantage of this table variant becomes apparent at the latest after a rain shower � as the water simply drips through, the mesh-shaped surface dries all by itself and is quickly ready again to greet your next customers. The metal structure of the table top is smooth and level, allowing glasses and cups to rest firmly in place.